My name is Skeeter Wilson and I specialize in helping buyers and sellers purchase and sell real estate in the Denver Metro area and the surrounding areas including Boulder, Broomfield, Westminster, Northglenn, Thornton, Commerce City, Erie, Louisville, Lafayette, Brighton, Fort Lupton, Fredrick, Dacono, Longmont and Firestone. 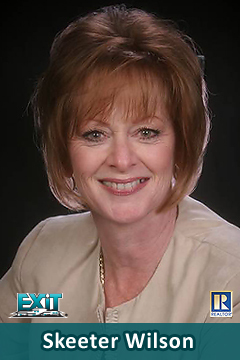 Exit Realty is the 7th largest real estate firm in the country and is enjoying continuous growth. Exit Realty strives to be the leader in the real estate industry by making available the necessary tools for their agents to be able to succeed and this includes keeping us informed of all of the state of the art technology. At the 2009 convention Exit One Realty was presented the “Esprit De Corps” award and 4 of their agents are also Past Presidents of the Realtor Association. Outside of real estate I like to stay involved in the community. I am a graduate of the Thornton Citizen’s Police Academy and a member of their Alumni. I do volunteer work for the police department throughout the year. My husband and I are also active members of the American Legion Post 22, the VFW and volunteer for Rebuild Denver each year. I have 3 beautiful daughters and 8 wonderful grandchildren. My next love (besides my family) is golf and you will find me on the course every Tuesday with a great group of girls. I also enjoy gardening, dancing, music, reading and traveling when I get the chance.